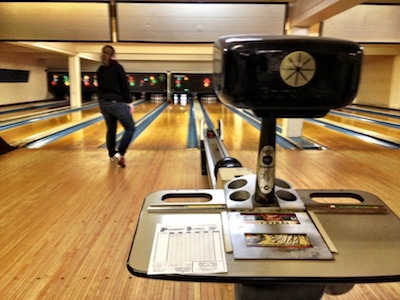 Dormont Lanes – BYOB Bowling of Awesome! So I went to Dormont Lanes last night to get a little practice in before the “Bowl for Kids” event we are doing at American Eagle. In looking for information on the location it’s amazing that this place doesn’t have a website. Makes you wonder how a place can be in business without a website in this day and age. Anyway the place is pretty cool. Even though it’s super retro and dirty/getto, but it’s BYOB and pretty cheap. Monday nights they do a bring a friend night where you can get games for $4 bucks. 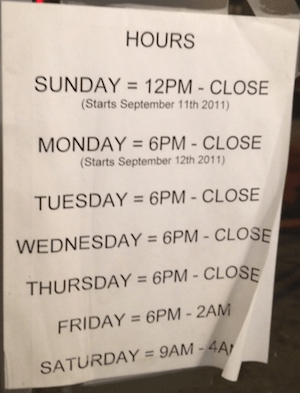 Their hours are a little weird so here is pic of the hours for your connivence. I believe close is around 11PM most nights.